This is an efficient pet hair remover mitt for you to brush away dirt, dander and loose hair from cats and dogs, very practical and convenient. You can remove the loose hair easily and massage for your pet with this glove, and it can help promote blood circulation while massaging your pet. Pet will love it! It can help you effectively brush away dirt, dander and loose hair from cats and dogs. Five finger design is convenient to groom & clean hard-to-reach places like tail or face. The shedding hair can stick to the glove, which is very easy to peel and throw the hair away. The soft silicone can provide comfortable and relaxing massage for your pets without painful removing of fur or scratching the skin. Designed for long, short and curly hair dogs and cats, grooming the hair quickly, gently and effectively. 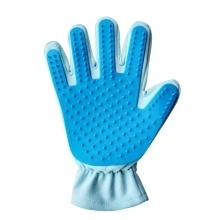 Right hand design, great massage brush glove, it will not hurt the pet and can work well, very practical.